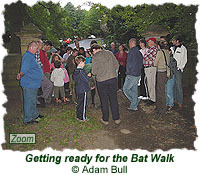 This was a very well attended event, with around 40 people gathering at dusk to join the walk led by Graeme Ashton (Leeds City Council Countryside Services Ranger and FGVW Core Group member). 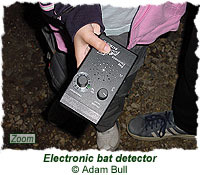 Graeme talked about the bats native to the area and provided electronic bat detectors for people to use as the walk proceeded through the woods. He explained how the different bat species could be identified by the frequencies of noise they made, as picked up by the bat detectors. Bats identified during the evening included pipistrelles and daubentons. At the end of the walk Graeme gave out information packs to those interested in learning more about the bats they has seen, as well as others found in the UK.